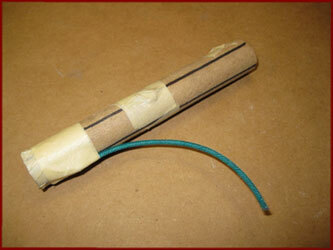 How To Make Advanced Firework Saxons — Skylighter, Inc. This is the second part of a two-part series on saxons. Before embarking on these advanced saxons, you should have learned all the techniques in the first part, "Basic Saxons." Now that we have those basic saxon construction techniques down, let's explore some more-advanced, more-complex, and longer-lasting versions of these simplest of wheels. Please follow all of the safety precautions including those outlined in "Basic Saxons." In "Basic Saxons," we made a fuel "base mix" and combined it with an "effect additive," in that case spherical titanium particles, to create a titanium spark fuel for use in our saxon. Following the same basic fuel procedures, we'll now learn three new "effect additive" formulations. Each of these will create a new saxon fuel. Each of the new fuels will burn with its own unique effect. Here are pictures of the saxon effects we will be able to create with the three new fuels plus the earlier titanium spark effect. 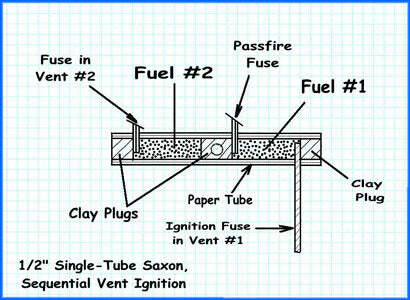 The added charcoal in this fuel can be 36-mesh (as indicated in the table above), 80-mesh, or airfloat charcoal. The larger the particle size, the more pronounced the charcoal sparks will be. Antimony sulfide is sometimes referred to as antimony trisulfide. Either Chinese-needle or dark-pyro antimony sulfide will work fine. The aluminum should be glitter-type atomized material. 200-mesh magnalium may be substituted for the aluminum, and will create a slightly different glitter effect. Either Chinese-needle or dark-pyro antimony sulfide will work fine. The aluminum should be glitter-type atomized material. I have not tried substituting magnalium for the aluminum in this formula. With one or two very simple modifications, we can change the basic saxon we made in part 1 to make it last twice as long and to add some variety to its display. To make it last twice as long, we'll simply ignite one vent hole at a time (sequential vent ignition), with the first half of the saxon's fuel passing fire to the second vent hole as it completes burning. To add some variety to its display, we can ram a different fuel in the second half of the saxon than we do in the first half, creating a color-changing effect as the saxon transitions from the first half to the second half's display. Of course, if you simply want to double the original saxon's display time, but keep it all one effect, the same fuel may be rammed in both halves of the device. You can see in the sketch below that this saxon is very similar to the first one we discussed. But in this case, the first half of the device is ignited by a piece of visco ignition fuse installed directly in its vent hole. Then, when that first fuel section is just about done burning, the passfire fuse will be ignited. The passfire fuse will then pass fire to the second vent-hole and the second fuel section will take fire. We'll follow the same steps making this saxon as we did the first time around, with a few minor modifications. The holes to be marked and drilled for this saxon are identical in size and location to those for the saxon we built in "Basic Saxons", with one exception. You will need to drill an additional 5/32-inch passfire-fuse hole as shown below. It should be on the same side of the tube as the vent hole to which it will be passing fire, and 2-inches in from the end that has the visco-ignition vent hole. The first clay plug should be rammed in the end of the tube that has the visco-ignition hole and passfire hole nearest to it. This would be the right end of the tube in the photo above. After the first clay plug has been rammed, insert a 4-inch piece of visco ignition fuse about 1/2-inch into the first vent hole, just above the plug. Tape the fuse in place with two wraps of masking tape. Note: When using masking tape on any saxon assembly, do not cover the vent hole locations with more than a total of two layers of tape. We don't want to over-contain those areas at ignition. To do so could potentially create a mini-explosion instead of a gentle fuel ignition. Ram increments of fuel in the tube until the second, optional, mark on the rammer is even with the top of the tube. At this point the fuel will be right up to the bottom of the passfire hole, as shown below. If necessary, a hand-twisted 1/8-inch drill bit can be used to clean any excess fuel out of the passfire hole and the area right inside it. Then insert the end of a 3-1/2-inch piece of fast-fuse half an inch into the passfire hole. Tape it in place as shown below with two layers of masking tape. Then ram the final fuel increment in the first section of fuel, followed by the middle clay plug. The second fuel section is rammed as before, but a different fuel may be used in this section to create a color-changing saxon. Visually it works best to first display a lower-intensity effect such as the charcoal-spark or gold-glitter fuel, followed by a brighter effect like the silver-glitter or titanium-spark fuel. The saxon is now finished as before, with the passfire fuse inserted into the second vent hole before the final fuel increment is rammed. Following the last fuel increment, the final clay plug is rammed. This saxon lasted longer, about 8 seconds, because of the two-stage ignition, and also has the variety of the color change. So far, we've made saxons which only spin in one direction, even when the vent holes are ignited sequentially. But a simple variation on the sequential ignition saxon described above is to have the two vent holes on the same side of the tube, as well as the passfire hole. This creates a saxon which will spin in one direction until the passfire ignites the second fuel section, at which time it will reverse and spin in the opposite direction. We can get an even longer burning saxon, with more variety, by building a more-advanced version. You can see in the sketch below that this model is simply a longer version of the saxons we just made, which uses two tubes, rammed individually, and joined in the middle with a section of wood dowel. This is simply a "stretched-out" version of the saxons we've already tackled. The basic concept of the two-tube saxon is the same as the models we've already explored. But twice as much fuel is used, and each half of the saxon can be made with two different fuels, resulting in as many as four effects being displayed as the saxon burns. the overall spray of sparks will become larger. Glitter compositions are a bit less powerful than the charcoal and titanium spark ones. We don't want to make the dowel so long that the saxon stalls while displaying these weaker effects that have less thrust. Except for the first alignment mark on it, the rammer has to be marked with new marks to keep track of the ramming of the two tubes for this saxon model. Making the new marks on the rammer is best done by using a full-scale sketch of the saxon, and then aligning a tube and the rammer on the sketch. Make an alignment mark at each location where it is needed as in the photo below. The distance to measure up from the bottom of the rammer (the right end of the rammer in this picture) is indicated in the annotation for each alignment mark. A new mark location, annotated "Switch Fuels Mark," has been added to denote when the switch to a different fuel should be made in each tube for the four-color model we will be building. The following construction steps are very similar to the steps which were used to construct the basic saxon in part 1 of this series, with a few differences. Pre-drilling the two tubes is the first operation, and is simpler than with the single-tube saxons. The center spin-axle hole will be drilled later after the two tubes have been joined on the wood dowel. Mark the tube for hole drilling as was done for the saxon in part 1. This saxon will have a passfire fuse for sequential vent ignition. One tube has two 5/32-inch holes drilled in it. The first hole is the vent hole where the visco ignition fuse will be installed. 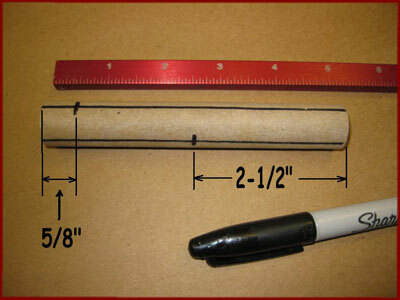 Its location should be marked on one of the lines, 5/8-inch from one end of the tube. The second hole is for the passfire. For this reversing saxon, the passfire hole is on the same line as the visco ignition fuse hole. 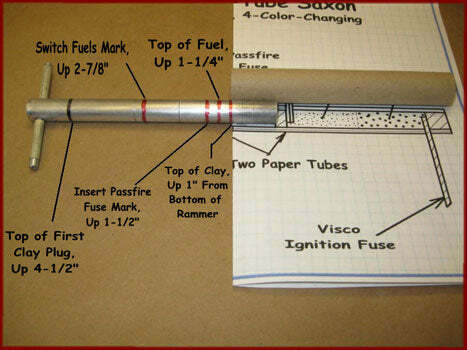 It is marked 3-5/8-inches from the same end of the tube you measured from to mark the visco ignition hole, as shown in the photo below. The second tube only has one vent hole drilled in it, which will be ignited by the passfire fuse. Mark its location 5/8-inch from one end of the second tube. Use a sharp awl to poke indentations at these three marked locations, which will make it easy to center the drill bit when drilling the holes. Insert a sacrificial 1/2-inch wood dowel into the tube to back up the drilled areas as they are drilled. This will prevent the inner layers of paper from being pushed inward as the holes are drilled in the tube. Drill 5/32-inch holes at all three hole locations shown in the picture above. Stop drilling when the drill bit has completely drilled through the paper tube, and is just starting to drill into the wood dowel. The vent holes are treated with super-glue as in the part 1. Use 1-inch-square pieces of masking tape to temporarily block the end of each tube nearest the vent holes, and all three drilled holes. We will ram the clay and fuel into both tubes before we connect the two of them into the final assembly. The ramming of the clay plugs and fuel sections is done as with the simpler saxons in the part 1, paying attention as you go to the revised rammer alignment marks you created above. As each tube is rammed, the type of fuel is switched when the "switch fuels" alignment mark is even with the top of the tube. The passfire fuse should be cut 7-inches long when it is installed in the passfire hole at the top of the fuel in the first tube. After the clay plug is rammed in second tube (the tube with only a vent hole), a 1-1/2-inch-long piece of fast-fuse should be inserted into the vent hole. The two passfire fuses will be joined after the two tubes are glued to the section of wood dowel. The two ¼-inch-thick clay plugs which finish off each tube only use 1.5 grams of clay each. Their function is simply to hold the fuel in place, and to block the flame from passing by the wood dowel when the fuel is done burning in the first tube. It helps to have the sketch in front of you as you ram the various sections in the tubes, with the different fuel segments labeled to keep easy track of them. The two rammed tubes should be super-glued to the 2-inch wood dowel, with the thrust vents pointing in same direction (that is, with both thrust vents on the same side of the completed saxon). The joint between the tubes should be taped with two wraps of masking tape after gluing. The two sections of passfire fuse should be trimmed to length so that they overlap by 1/2 inch. 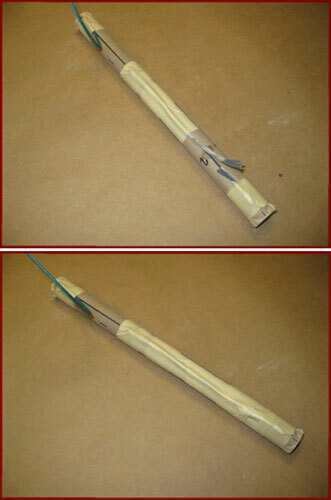 The overlapping fuse ends should have the internal match bared, and the fuses should be securely taped with masking tape, as shown below. The 9/32-inch axle hole is drilled through the tubes and the wood dowel where the tubes meet in the center of the assembly. The hole should run front-to-back on the saxon, whereas the vent holes exhaust to a side, as also shown on the sketch. A reversing double-tube saxon like the one we've just built is shown on the left in the photo below. It has the two vent holes and the passfire hole all on the same side of the assembly. Also shown for comparison is a non-reversing single-tube saxon with vents on opposite sides of the tube such as we built in part 1 of this series. The video shows the double-tube saxon in action, with an initial charcoal-spark section followed by a gold-glitter section in the first tube. Then the direction of rotation reverses as a silver-glitter section in the second tube ignites, followed by the final titanium-spark section's display. 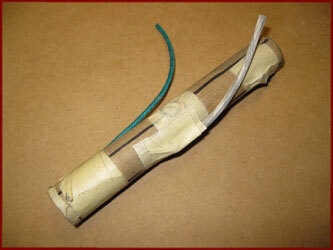 Double tube, reversing and coloring changing saxon firework. Are there some other variations we can play with? Well, sure. Larger saxons, and one more-complex assembly (as well as combinations of multiple saxons) will be briefly described as inspirations for further creativity. And, besides using super-glue on the paper-tube vent hole, there's an even better way to prevent erosion of the vent hole by hot exhaust gasses and the resulting loss of thrust. The obvious way to increase the size of a saxon's display, along with its duration, is to step up in size. John Werner's original tutorials dealt with these larger 3/4-inch models. The construction procedures will be basically the same for 3/4-inch saxons as for the 1/2-inchers. So, having begun with those smaller and simpler versions, moving up to these "big brothers" will be a breeze. Here are some measurements and basic construction details to get you started. Reversing saxon with bright titanium sparks. 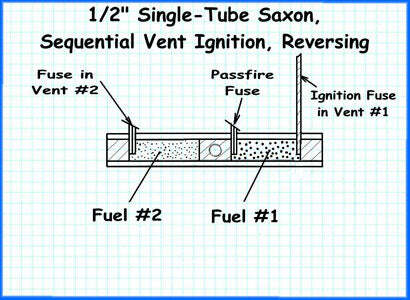 This is, of course, a sketch of a simultaneous-vent-ignition, non-reversing saxon. For one with sequential vent ignition as in the above video, a passfire hole and fusing would be located near the center clay plug, with visco ignition fuse in the vent hole nearest the passfire hole. To make the saxon reverse direction, both vent holes and the passfire hole would be located on the same side of the saxon. You can see that the single-tube model in the video lasted about 14 seconds, so we're increasing display duration with these larger models. The local lumber yards do not typically stock 3/4-inch diameter aluminum rod, so 3/4-inch oak dowels will have to suffice for simple homemade 3/4-inch saxon tooling. Also, copper-pipe caps do not come in stock sizes to reinforce the ends of such dowels. However, 1/2-inch galvanized threaded pipe caps will screw on the ends of the dowels if the wood is sanded down to a slightly smaller diameter. So, you're pondering to yourself, "What's that pointed rammer for?" The larger ID saxons in this next double-tube version present an opportunity for a different kind of vent-hole reinforcement. A "convergent" clay plug, with a funnel-shaped top, is rammed using 14 grams of clay and the tapered-end rammer. The 5/16" drill bit, twisted by hand, is then used to extend the paper-tube hole in through the side of the clay funnel until that hole meets the vertical funnel-shaped cavity in the plug. The compacted clay inside the paper tube prevents the hot exhaust gasses from enlarging the vent hole during the saxon's burn, which would reduce thrust. Rather than the exhaust gasses simply passing through a paper-tube hole, there is rammed clay inside that hole, and the clay does not burn or enlarge when the exiting hot gasses pass through it. 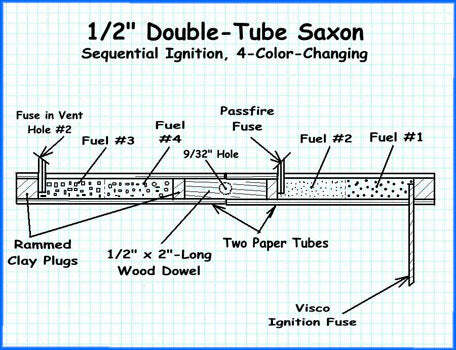 Here's a sketch of one of the tubes for a double-tube, 3/4-inch ID saxon. Double tube color changing saxon. Changes from charcoal, to gold glitter, to silver glitter and finally to titanium sparks. One single fuel may be rammed in each tube of the multi-tube saxon, or two different fuels may be rammed in each half of the tube, as shown in the sketch and video above. That saxon lasted almost a half-minute. Here are some shots of a cross-shaped, 4-tube 3/4-inch saxon, with one type of fuel rammed in each of the tubes. This model lasted close to a minute, and was quite impressive. Since the fuel burns out of one tube at a time in such a model, it can be a challenge to keep the saxon balanced enough to keep it spinning. You'll notice that the bottom saxon tube (marked "C" for charcoal-spark) has the initial visco ignition fuse going into its vent hole. Then its passfire-hole fuse leads to the gold-glitter tube on the opposite side of the cross. This prevents two tubes on the same side of the cross from emptying first, which would really create a seriously unbalanced device which might not spin under the thrust of the third saxon tube. Four tube saxon that changes from gold to flitter to white sparks. 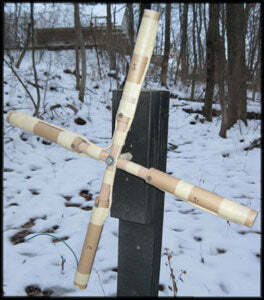 The two dowels used to make the cross have a "half-lap" joint, where a saw and knife were used to remove half the thickness of each dowel so they would mate together. Then the joint was glued, and drilled with the 9/32-inch axle hole. 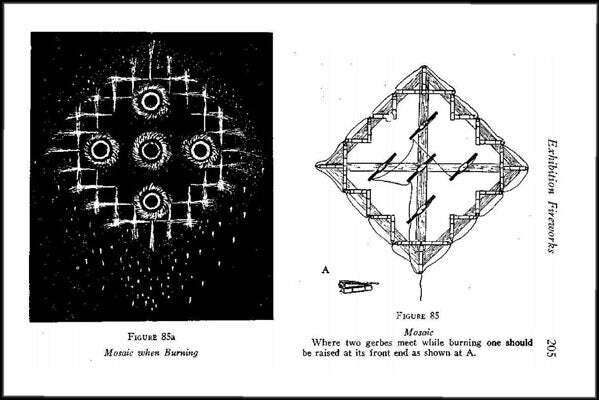 There are many details which build on each other to create a successful fireworks device. When I was making this failed one, as I was taping the fuse connection points at the vent holes I was really wrapping them well with masking tape to prevent premature ignition from stray sparks. I was thinking in the back of my mind, "I hope I'm not over-containing these areas, and creating little pressurized salute areas." Well, I was. In future models I stuck with the two-tape-wraps only, and had good success. Often, even after we follow detailed instructions to the best of our current abilities, we experience some failure of a device, or it simply fails to meet our expectations in one way or another. That's when persistent trouble-shooting becomes very valuable. Larger saxons, using 7/8-inch, 1-inch, or even 1.5-inch ID tubes are certainly possible to make, and will result in even longer duration displays. Multiple saxons have often been included in display set-pieces such as the five saxons in the center of the mosaic (shown below) in Weingart's "Pyrotechnics." So the sky is the limit when it comes to the creative possibilities with these relatively small and simple devices.